Did you know? The American Red Cross nationally responds to an emergency every 8 minutes! 95% of local emergencies are home-fires. Locally, you can select your shifts ahead of time, and disaster meetings take place monthly in Charlottesville and are in the evenings (630P). 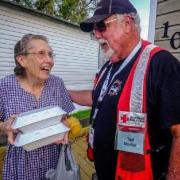 Join our amazing Red Cross volunteer network and serve as one a local Red Cross Disaster Responders or "Disaster Action Team (DAT) member. DAT members support their local community in their darkest hour. You respond in your community (includes county and city), but can expand your response radius. Red Cross disaster responders or "Disaster Action Team" (DAT) members bring the Red Cross mission directly to the client, they respond in their community, but can expand their response radius. All supplies, training, and orientation is provided by the Red Cross!